Rob and I arrived in Bangkok at 2 am. This time I convinced him that we should get a hotel and cab there. A cab was under $10 and was especially fast because traffic was sparse. We ended up at a nice clean budget hotel near the Phra Ram 9 metro station. The first day we slept in and relaxed until 1 PM then ventured a couple stops down the metro to Suhamvit station. Terminal 21, one of the new fancy malls has an amazing food court on the Fifth floor called Pier 21. 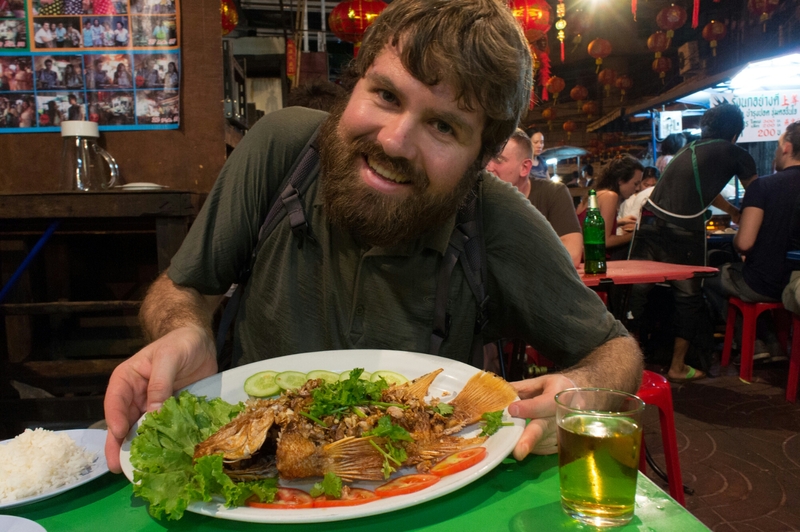 This was a cheap but clean and orderly introduction to Thailand dining. We had a spicy papaya Som salad with crab, steamed buns and chicken and rice followed by the best food ever, mango with sticky rice covered in sweetened condensed milk with a crunchy brown topping. 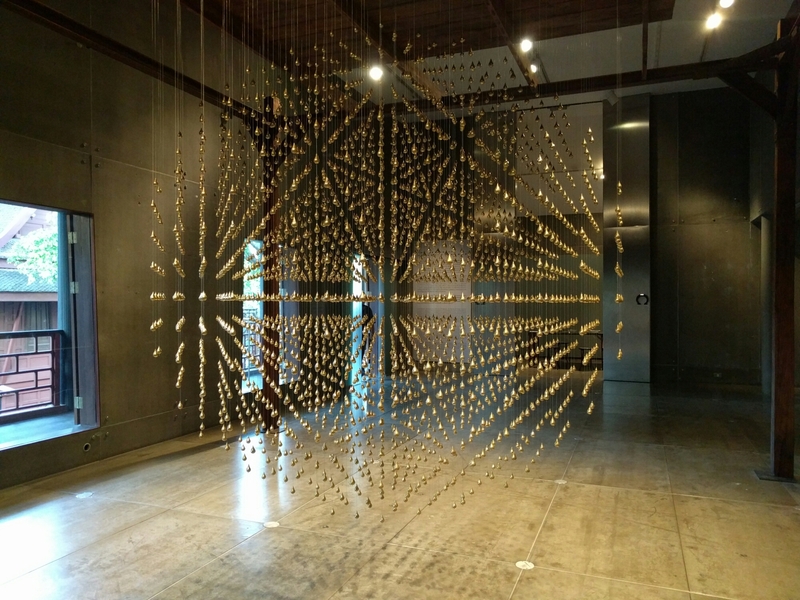 Afterward, we walked to the Jim Thompson house, the home turned museum of a fárang silk trader who disappeared mysteriously, for one of the last tours of the day. 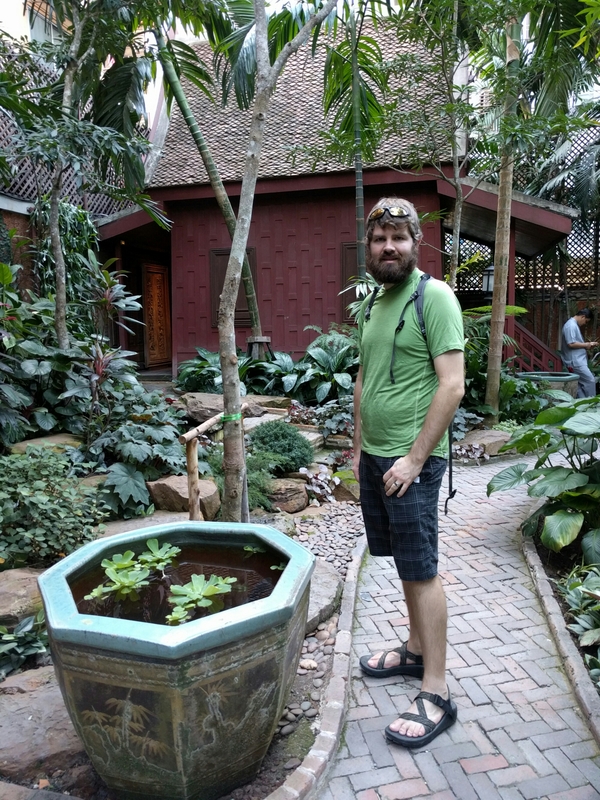 Rob in the Jim Thompson House Garden. The garden surrounding the house had large potters with fish and floating plants in them. After, we strolled to the Chinatown area for dinner. It was a bit of a walk but the Bangkok MRT and BTS systems weren’t convenient and we weren’t in a hurry. Coming from Tokyo’s busy but well-ordered streets, walking in Bangkok felt a bit like Frogger. Despite the hassle, exploring at slower pace was nice to see ordinary life in the city. Bangkok is a city of such contrasts between the glitzy new malls with international stores to shacks made of wood and corrugated metal. 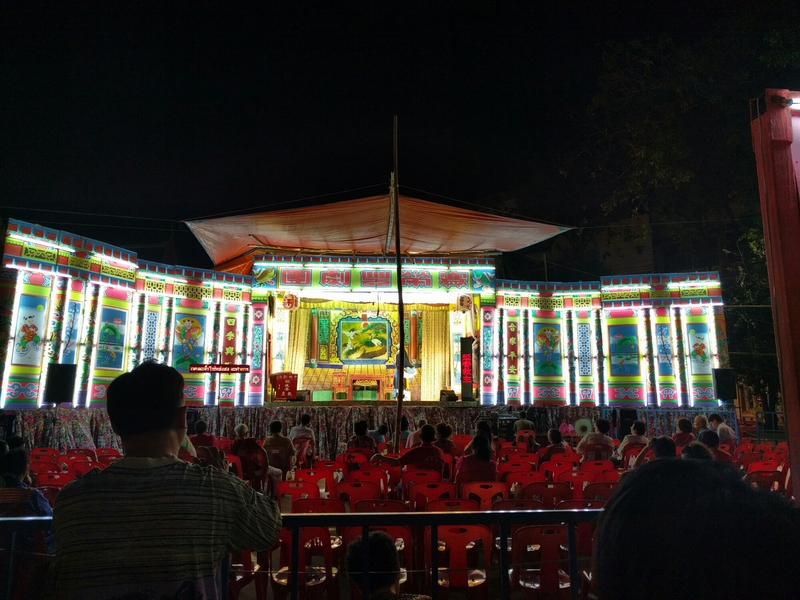 Street fair at a temple. We saw the lights and went to check it out. Random kabuki style show we passed by. The next day, we set out to the major historic sites along the river. 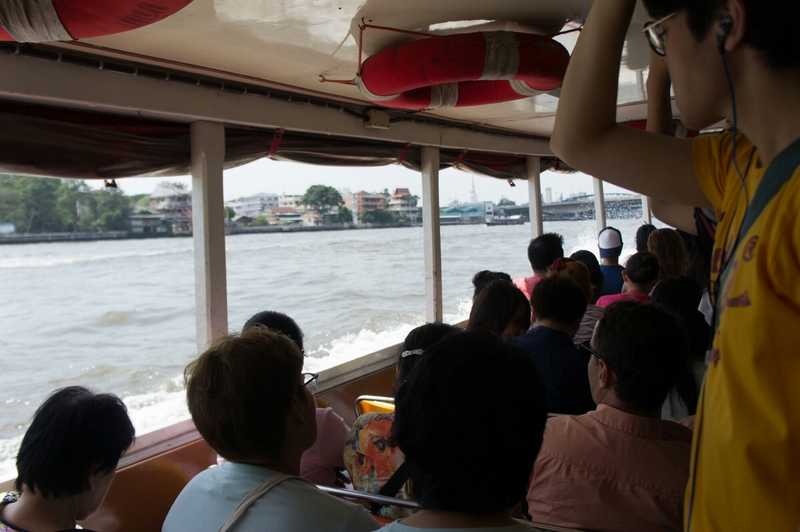 Steffen and Audrey mentioned the ferries as a good way to go, so we took the MRT to the end of the line in Chinatown. 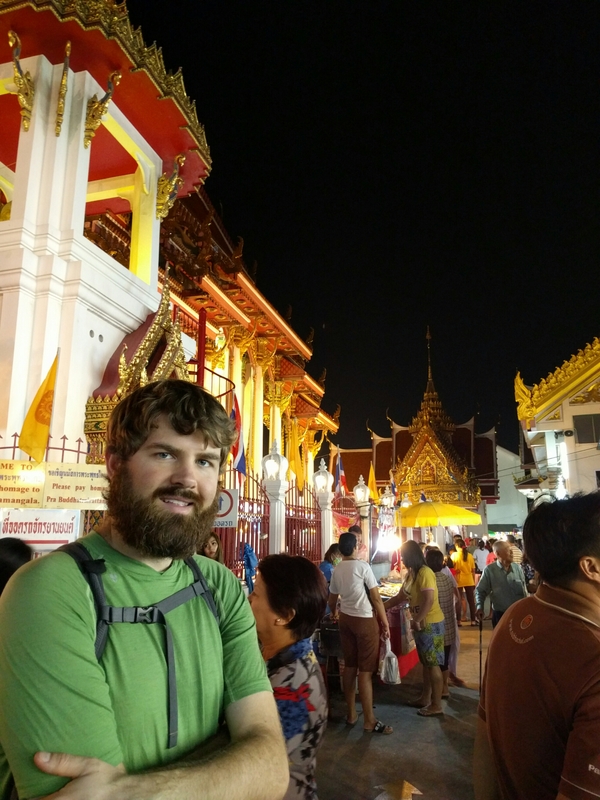 After checking out an extremely valuable solid gold Buddha that had been hidden in a plaster shell for along time, we picked up a boat to the Grand Palace area. 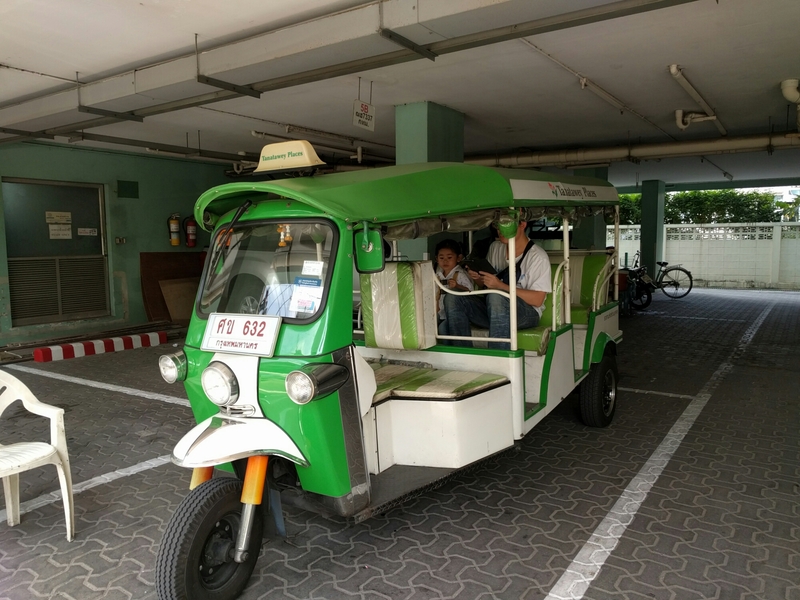 Our hotel's tuk tuk with free transfers to the metro. 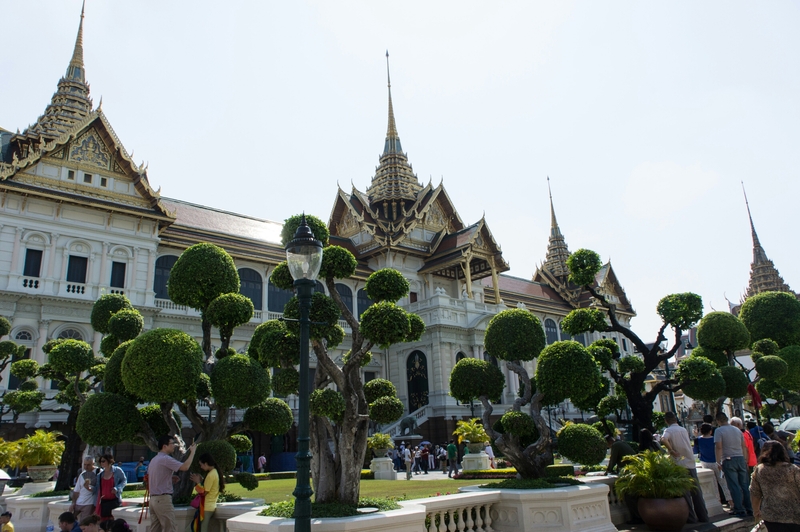 By the time we arrived, the Grand Palace was mobbed, but since many were with tour groups, they didn’t clog ticket lines. 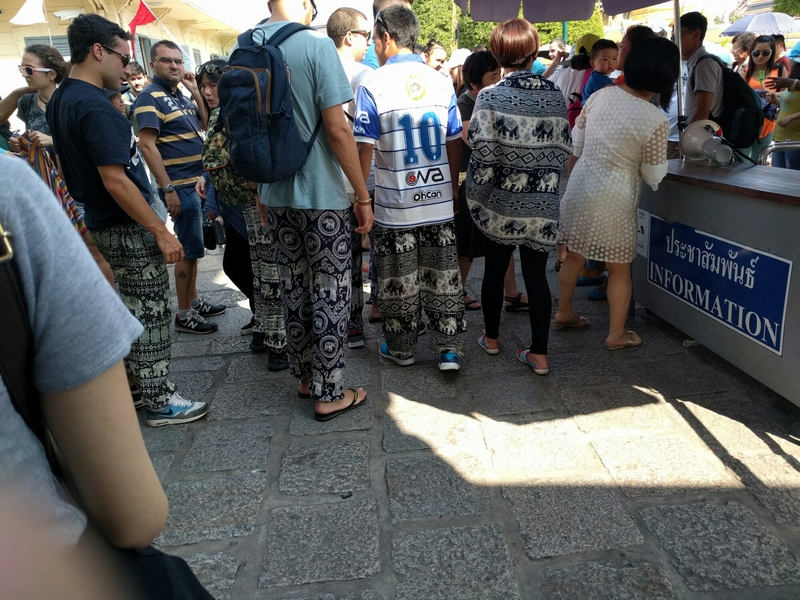 The dress code is highly enforced, but you can rent clothes for a deposit or buy some cheap clothes at the vendors outside. 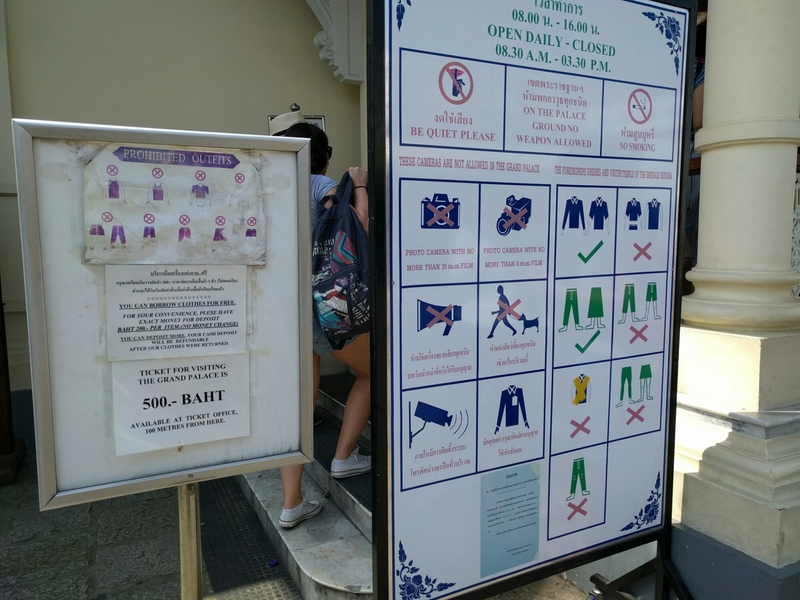 Dress rules for the Grand Palace. Rob had to borrow pants, which was the longest line. 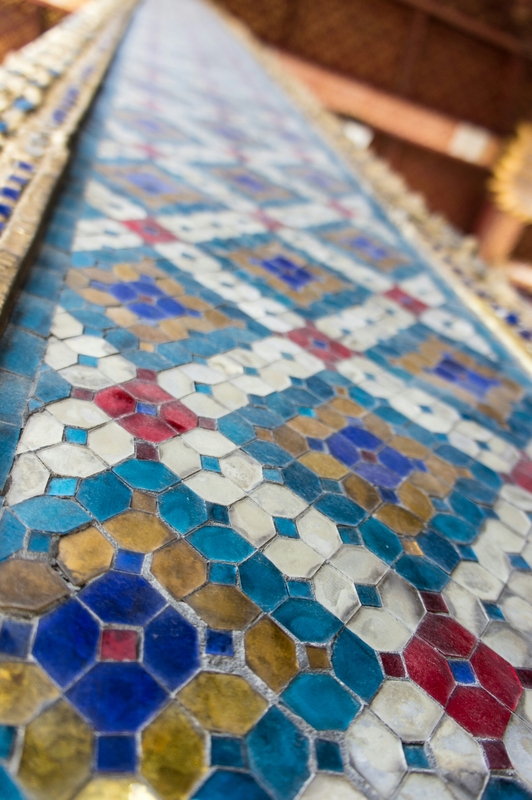 The main attraction of the Grand Palace is the Emerald Buddha complex. The building diversity and murals are quite amazing. 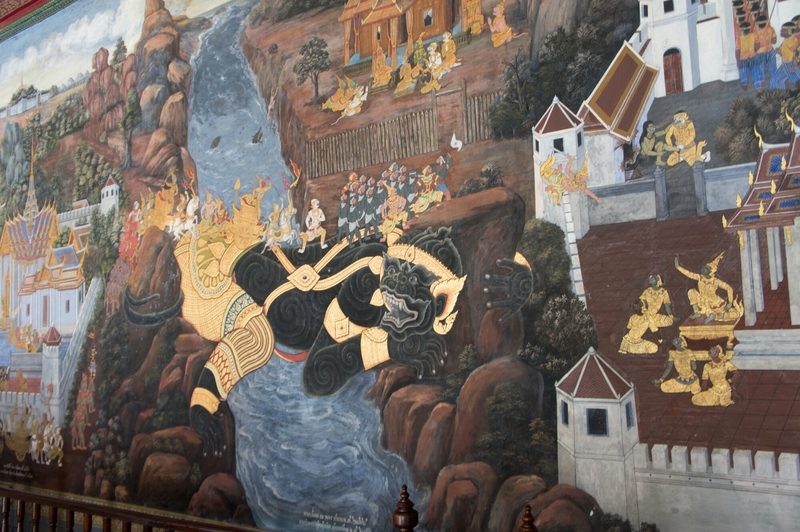 The murals especially seem endless. 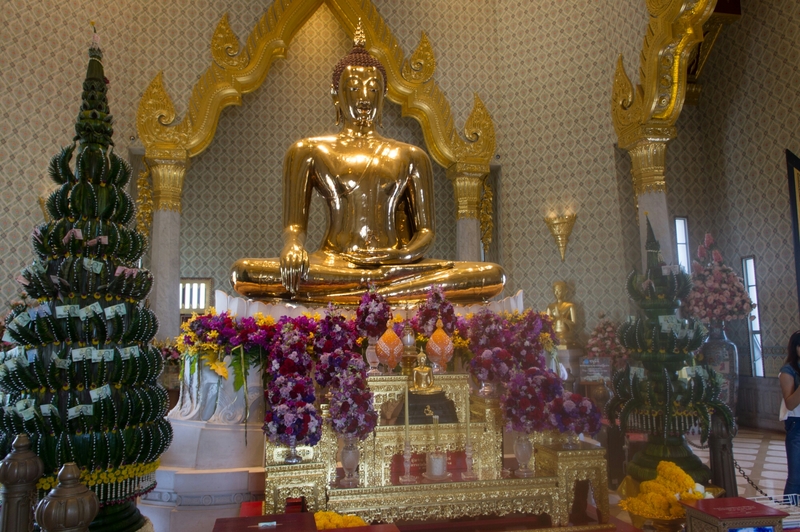 Thai temples are so amazingly colorful. Rob was having fun with the camera. The plant amnesty people would have a fit. I thought this guardian was neat. After finishing at the Grand palace and snacking on a Thai style takoyaki, we headed to visit a university founded by one of Thailand’s great Democratic advocates. While we were examining it, a few students came over to pay their respects. This seems to be a big cultural difference in that people here worship at the city pillars and monuments of venerated historical figures. 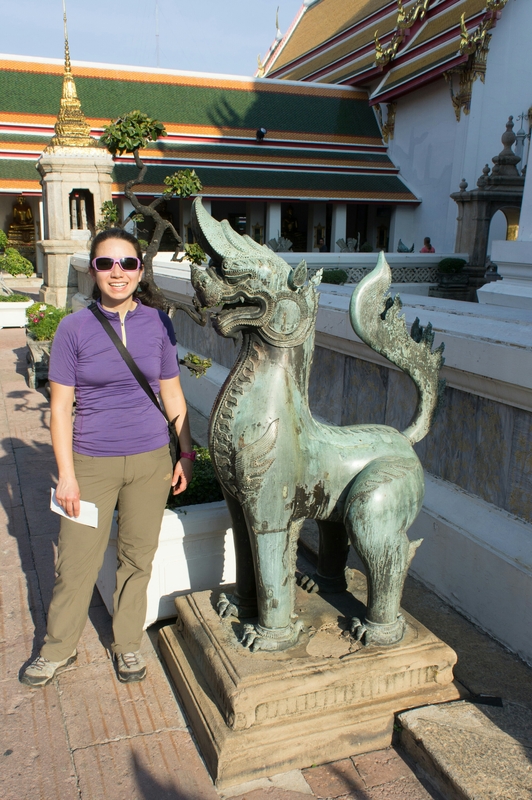 Finally, we arrived at Wat Pho to check out the amazing reclining Buddha. 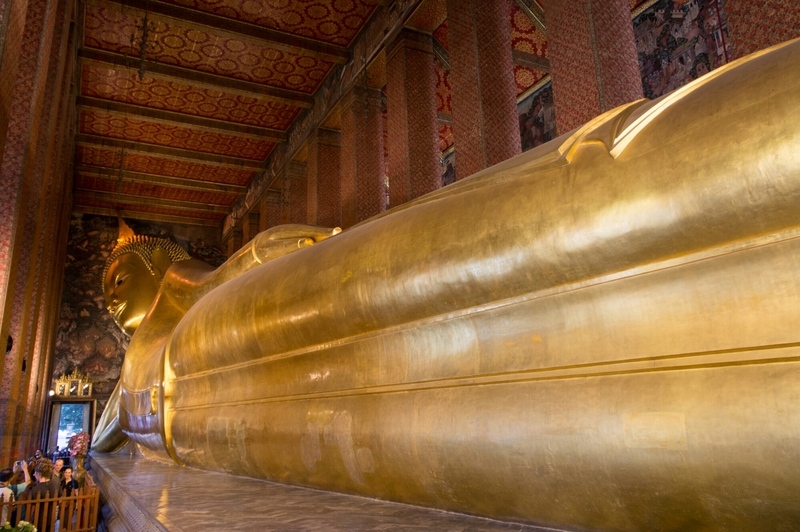 The reclining Buddha is huge. This picture doesn't even have the feet. 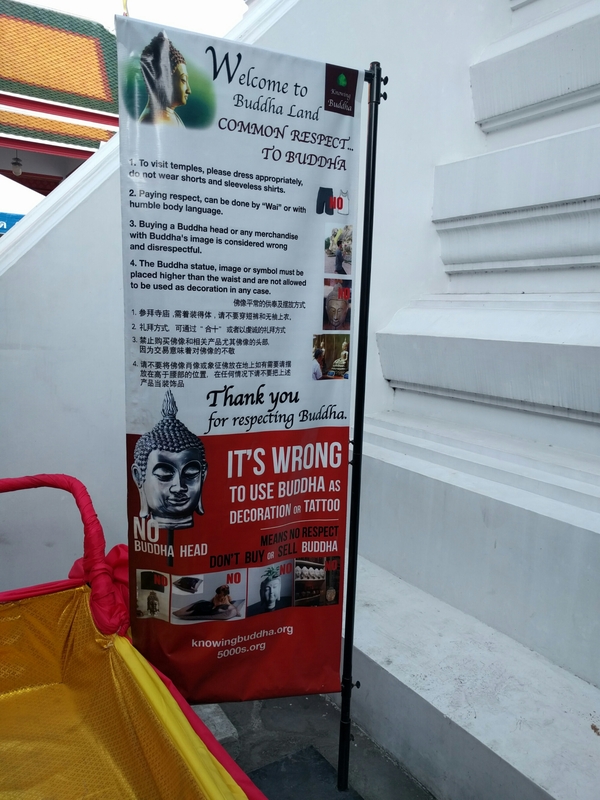 Buddha is not decoration campaign. These signs were at most temples. Exhausted, we sat down at a street restaurant and met some Thai civil servants. They mentioned a street festival, so we headed there next to find our next plate of food. Plates of food are cheap, but portions are small by Western standards. The festival had a large street of food stalls, but like festival food anywhere, it was way over priced. I was definitely tempted by the colorful beverages served with in bags with a straw. There was also a shopping strip reminiscent of any Seattle street fair. By this time, it was getting late, so we headed to the riverbank to catch the ferry. Since we had just missed one, we walked toward the previous stop on google maps only to find deserted piers perhaps long out of use. On foot we continued to Chinatown nearly avoiding scooters barrelling along the sidewalk holding food stall carts next to them like side cars. Eventually, we popped out at this street restaurant that looked amazing the night before but had a massive line. 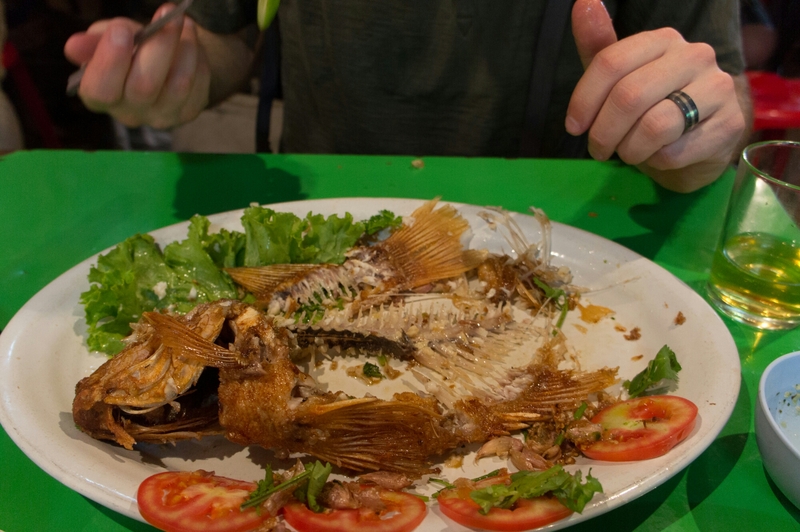 Tonight was quieter so we joined the queue when Rob got his stomach set on eating their deep fried whole fish. We chatted with the nice folks behind us in line and watched the staff prepare an array of dishes while avoiding the wok flames and occasional cars. 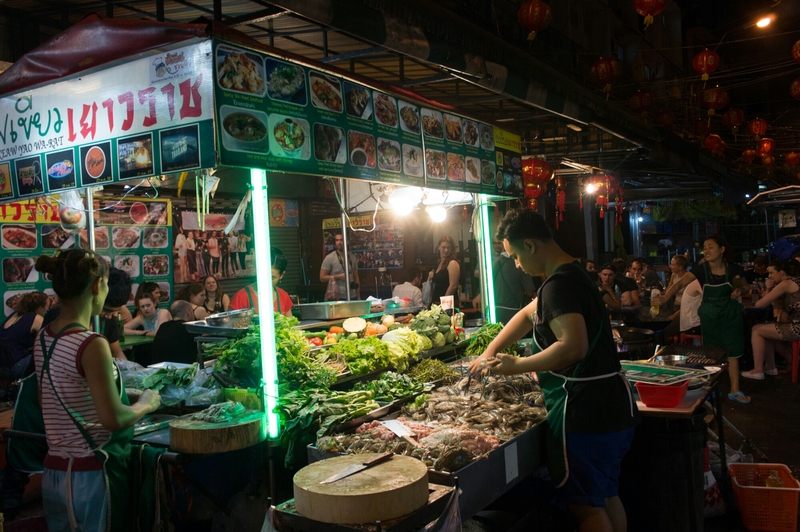 Our favorite meal in Bangkok. Rob and his fish before. We also had some fried morning glory that was great. The aftermath. Not quite a Hassan or Mike job, but we did pretty well. The next day we switched our room to a cheaper because hostel to meet some folks and get better Internet as we needed to do some planning. For lunch, we hit up the Or Tor Kor fresh market. We picked out a curry plate, a slab of pork and some papaya salad. Then, we had a dessert fruit course tasting durian for the first time and getting pomelo for later. Afterwards, we wandered the huge Chatuchak weekend market nearby. As neither of us was desirous of purchasing anything, sonbrowsing didn’t last too long. Since it was Valentine’s day, a local food company hired a group of young men to give out roses and chocolate coated potato chips. These were the only things we acquired. It’s easy to be restrained about shopping when you know you’ll have to carry it for months. After all that arduous shopping, we headed to the hostel for some planning work and free coconut ice cream. The hostel has a tub of coconut ice cream in the freezer for guests to eat. I’m pretty sure that’s why Rob chose it and think he probably ate about half our room rate of it. After dinner at a bustling Chinese seafood restaurant down the street, we packed our stuff and prepared to leave early the next day for Pak Chong and Khao Yai National Park.